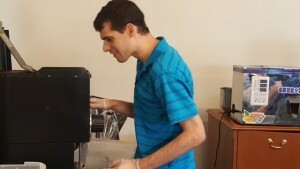 Creative Living Coffee is a program of Medina Creative Housing that offers vocational opportunities to students and other individuals with disabilities. When you enjoy a cup of Creative Living Coffee, you make an impact on the local community, an international community, and you leave an impression on people throughout many life stages. To find out how and why Creative Living Coffee makes a difference, I sat down with Tim Hagerty, who oversees business development of Creative Living Coffee.